Joe Gibbs Racing has promoted Chris Gabehart from its No. 19 NASCAR Xfinity Series team of Brandon Jones to be the crew chief on its No. 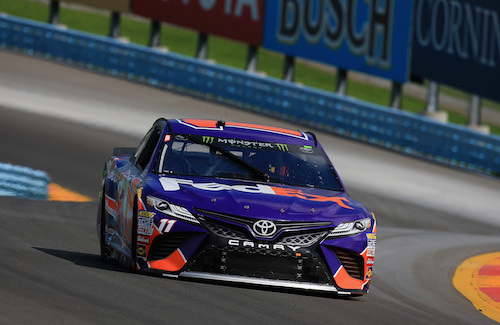 11 Monster Energy NASCAR Cup Series team of Denny Hamlin, replacing Mike Wheeler, who moved to Leavine Family Racing to be the crew chief on the No. 95 team of Matt DiBenedetto. The No. 95 team has a technical alliance with Joe Gibbs Racing with a switch to Toyota for 2019. Gabehart has been a crew chief within JGR’s Xfinity Series program for the last three seasons. In 98 races as an Xfinity Series crew chief, Gabehart has nine wins, including a win with Hamlin at Michigan International Speedway in Brooklyn in 2017. Gabehart also has paired up with Hamlin for one Cup Series race already, filling in for Wheeler at Richmond (Va.) Raceway in 2017. That effort produced a fifth-place finish. Jeff Meendering will replace Gabehart as crew chief on JGR’s No. 19 Xfinity Series team after two years as the crew chief on the No. 00 Stewart-Haas Racing team of Cole Custer. Meanwhile, Ben Beshore will be the new crew chief on JGR’s No. 18 Xfinity Series team, replacing Eric Phillips, who has moved with Gabehart to Hamlin’s No. 11 Cup Series team to be its new car chief. Beshore was an engineer on JGR’s No. 18 Cup Series team of Kyle Busch.